Another thought - knit your own sweaters, especially if you like vintage style. That way you can do it with non-toxic, ethical wool. As far as other clothing goes, I'm looking into buying some organic linen and running a few items up. I'm not a great sewer, but as I like simple designs this could work and has the benefit of everything actually fitting. If you can't sew, perhaps a seamstress could make a few items for you. Whilst that might seem costly, I think it reflects the REAL cost of clothing. You are totally right Madeleine! I meant to put "make your own" in the chart above and completely forgot. Thanks for bringing that out. I agree it reflects the true cost! This is truely great. Greatness and beyond! I will use, as I have reduced my annual shopping budget for next year, because I really feel I have everything I need. Thank you!! These are so great! You probably don't remember me, but I used to read STAL. I found you from your article about the Balenciaga coat on Elle.com. It's nice to see how your writing matured over the years. I love the no-nonsense way you've distilled all this capsule wardrobe-minimalist mumbo-jumbo to its very essence. Workbooks and e-guides are great, but not everyone has the time for that, so these quick and dirty versions are truly helpful. Great list, as always! I've found great luck thrifting for vintage sweaters (so warm! ), skirts, winter coats, button-downs, and blazers. After searching for a while for a pair of casual pants, I bought a new pair recently. I didn't want to, but: I couldn't find a thrifted equivalent, the fabric on my old pair was worn out, I can wear my new pair year-round, and probably consign when I'm done with them. I think because I put so much thought into them, I am confident I made the right choice and every time I wear them, they make me happy! That's wonderful Rachel! From your Tumblr I can tell you think a lot about the high cost of fashion and buy responsibly. 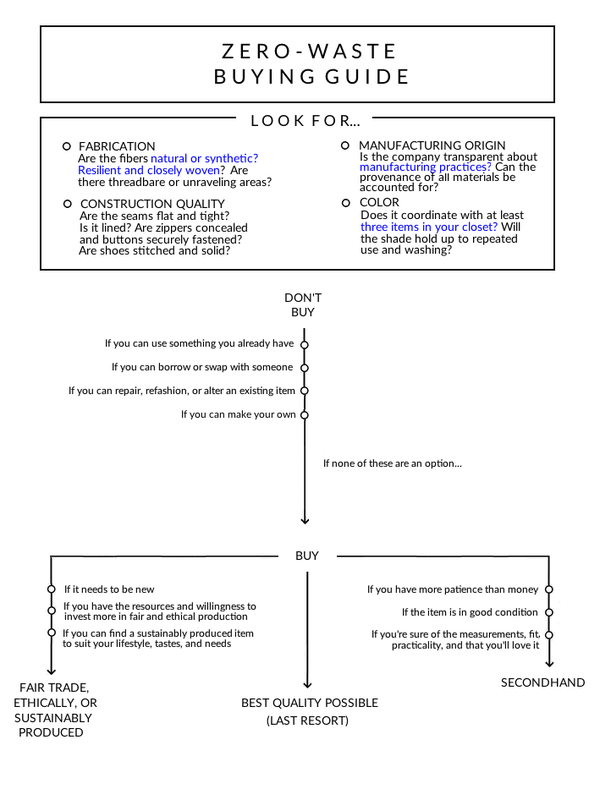 I should put more thought into my purchases like you- a few times, if I couldn't find something thrifted or fair trade I just bought what I *thought* was sustainable and realized after that it was the wrong choice. Great thanks for the slew of wardrobe posts. They bolster the pause I need to keep from buying when I don't need a single thing. I will return to this one when I want to make a purchase. Hi Annabel, comments like these make me so happy, thank you! "Despite this, the idea of having a small wardrobe seems old-fashioned and restrictive to some. " I have this problem. As a first step, I learnt to recognize quality. But got really used to the variety. That I now have a non-minimalistic closet of high quality second hand clothing. Years of a habit - hard to wean off. Restrictive is the right word. I do admire everyone who can turn it around and get by with a tiny closet. I did a 10 item closet experiment for 3 months. It was liberating. But I couldn't sustain it. I was missing the variety after a while. As I brought in the stowed away items, it made it a pleasure dressing in the morning. The act of choosing was what I missed. I think you don't have anything to worry about, reading your blog, it shows how much care you put into purchasing and maintaining your clothing. I think a minimalist closet doesn't depend on a number, but depends on the thoughtfulness of the owner. If you're wearing everything and you love it, why change? When I think of small or minimalist wardrobes, I think of those wardrobes that aren't full of unworn, unloved items purchased as a result of mindless consumerism. I do not get the impression that you are a mindless consumer by any means, quite the opposite, actually. I definitely have a maximalist closet. I'm a champion thrifter so it was fun and inexpensive to come by. But since I've been pregnant, I've found myself with a de facto capsule wardrobe. I'm glad that I have gotten a taste, but I know for sure that it is not for me. The biggest change is how often I need to do laundry now. I can't stand doing little loads more often. I preferred being able to get into the "laundry zone" and spend all day on it and be done for the next 2 months. This is crazy, I was just reading your blog a few days ago! I was looking for winter bike outfits and came across a picture on your site and just kept reading! Thanks for sharing your experience. Your closet sounds beautiful! If you don't mind me asking, about how often do you do laundry? For me, I was able to reduce laundry by reducing my wardrobe- but, I don't have kids and most of my stuff can just be brushed or aired out. What are the items that you have to wash the most (if it's not too personal) ? I'm writing an article on how small wardrobes and laundry work but I'd like to get a feel for other people's experiences. 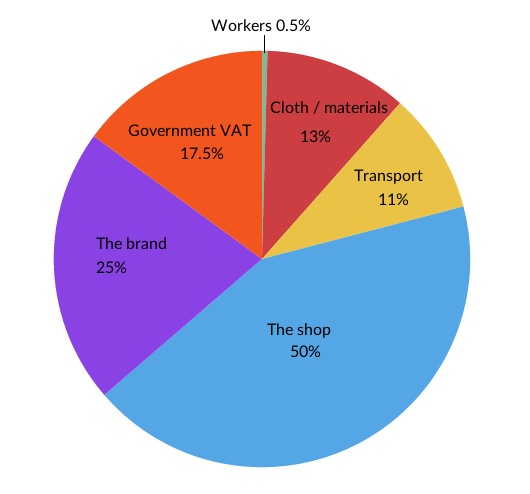 You mention that you have not found ethical clothing that matches your needs and lifestyle. Could you elaborate on this? What brands have you tried? I've noticed it's not all crunchy, hippie clothing anymore and the market has expanded greatly, so I'm curious what you mean by that. There's a lot available beyond loungewear and athletic clothing, as you note, but brands like Eileen Fisher and Le Mont St Michel don't fit me, my aesthetic, or my lifestyle yet. I'm not so into separates, and knee-length, tailored dresses in materials I like are difficult to find. I get the impression that most ethical brands design with the clothes hanger, tall, gamine woman in mind (actually most designers in general) and tailors can't always alter things to fit my body. I've found brands secondhand that worked right away, and I like that buying pre-existing stock makes the most of the energy embedded in each garment. Very interesting! I hadn't read it but I enjoyed the other articles on the site as well, about the soil and planned obsolescence especially. Thanks for sharing!